David Wilson Homes North West supports guide dog puppy – Our Space, Your Place. House builder David Wilson Homes (DWH) North West is continuing its long association with the Guide Dogs for the Blind Association by sponsoring a puppy. The £7,500 given by the homebuilder, which is currently building homes throughout Cheshire, Merseyside, Greater Manchester and Lancashire, will support the training of a two month old Golden Labrador Retriever called Wilson from the beginning of his journey towards becoming a fully-fledged guide dog. 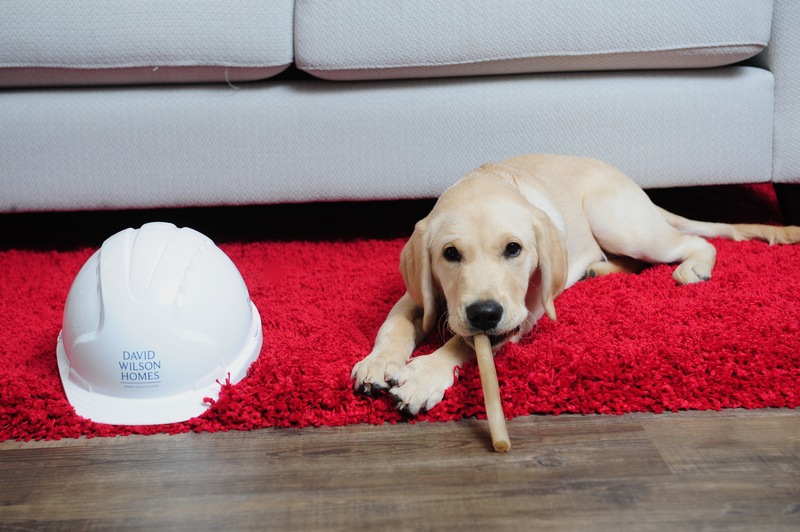 The homebuilder has a strong affiliation with the Guide Dogs having first sponsored a puppy more than 20 years ago. Wilson was part of a litter of eight puppies and his formal training will begin when he is around 14 months old and will last for three to nine months. Guide dogs can provide years of active service for their owner before retiring around the age of 10. David Wilson has been awarded the maximum five star official rating from the Home Builders Federation (HBF) for the sixth year in a row. The news was announced after more than 20,000 new home buyers across the country took part in this year’s HBF customer satisfaction survey.